BOOK OF HOURS -Leaf from a printed Book of Hours on vellum. BOOK OF HOURS - Leaf from a printed Book of Hours on vellum. Title : Leaf from a printed Book of Hours on vellum.. Date : Paris ca. 1518. Size : 7.3 x 4.5 inches. / 18.5 x 11.5 cm. Description :"A wonderful leaf from a Book of Hours printed on vellum by Gilles Hardouyn for Germain Hardouyn ?librayre demourant entre les deux portes du Palays en l?enseigne saincte marguerite?, Paris around 1518. On the recto we see the Planetary Man or Zodiacal Man (as a skeleton), painted by hand in beautiful colours, as bright as on the day they were applied!! On the verso are the months of January and February with the saints? days. At the top we find the number of days of the month with the note : ?quant est bissextiles? [ leap year ] there are 29. 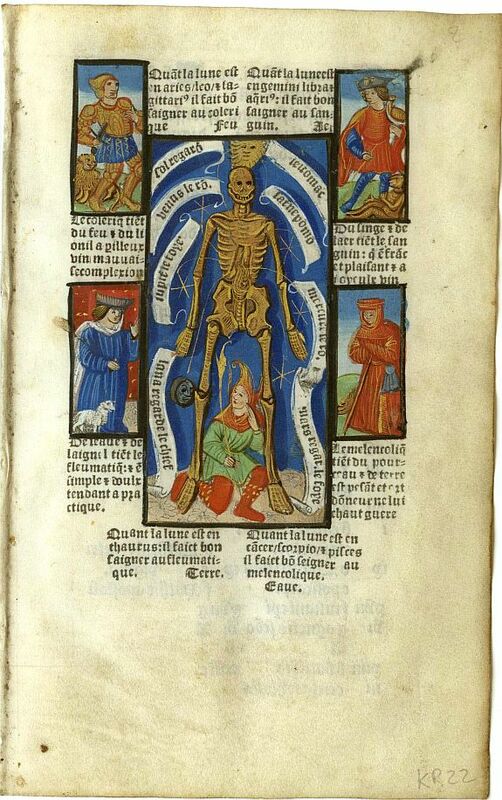 Among the extra images often found in the calendars of printed Horae are those illustrating the effects of the planets on different parts of the human body, shown here as a skeleton. Starting at the top of the main picture and proceeding clockwise, this diagram reveals that the sun [ considered, like the moon, a planet ] rules the stomach; Venus the kidneys; the moon the head [ the crouching jester alludes to lunar madness]; Mars, the gallbladder; Jupiter, the liver; Saturn, the spleen. In the corners are personifications of the four temperaments. The choleric, whose symbol is the lion, angrily stabs himself with a sword; he is associated with the element of fire. The sanguine calmly holds his hawk, accompanied by a monkey; his element is air. The melancholic leads a pig; his element is earth. The phlegmatic?s animal is the lamb and his element water. The instructions in the squares relate to the best times for medical procedures. The upper left tells us : When the moon is in Aries, Leo, and Sagittarius, it is good to bleed the choleric. See : Painted Prayers by Roger S. Wieck."